Characteristics of a route can be represented as a point event offset from an intersection. The reference offset data is translated to routes and measures for storage. 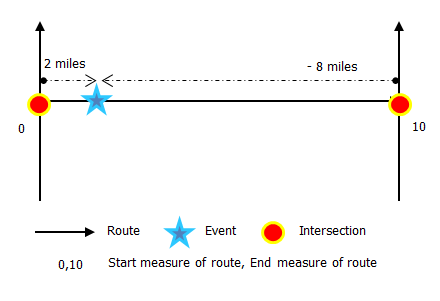 As shown in the example below, imagine the route has the From and To measure values of 0 and 10 miles, respectively. The event shown in the figure can be located at a distance of 2 miles from the intersection on the left or at a distance of 8 miles from the intersection on the right. Since the direction of calibration of the route is from left to right, the offset distance is calculated in the reverse direction (from right to left). Hence, the offset distance in the second case is shown with a negative number. Alternatively, the To measure could have been located by an offset distance of 6 miles from the intersection on the left. If there are no editable point event layers, the dialog box is disabled. 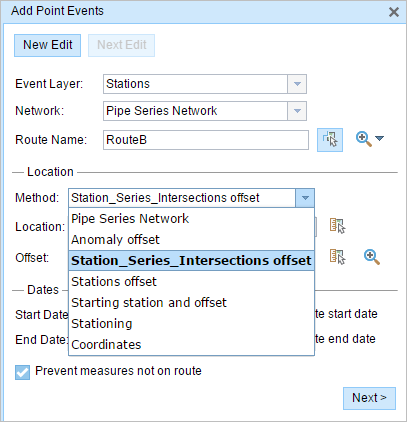 In the Location section, click the Method drop-down arrow and choose Intersection Offset (Intersection layer name with the offset suffix). All the intersection point layers that are published with the map service and are registered with the chosen network show up in the drop-down list. Select the direction of the offset by clicking the Direction drop-down arrow, typing the offset value, and selecting the units. Type the value and select the units. Click the Select an Offset Location on the Map tool and pick a location along the route on the map. This value denotes the distance between the intersection and the proposed measure on the selected route. If no direction is selected, a positive offset value will place the measure location along the direction of calibration from the selected point feature. If no direction is selected, a negative offset value will place the measure location opposite the direction of calibration from the selected point feature. The new event will be associated with the route (route name) from the LRS Network that the event location intersects. 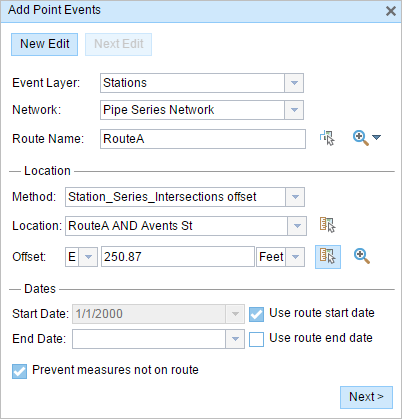 In cases where the input location intersection may have more than one route in the registered LRS Network (overlapping routes), a dialog box prompts you to choose which route you prefer the event to be associated with. Click Next to view the Attribute-Value table. This table contains all the attributes of the event layer. Fill out all the attribute information for the new event in this table. 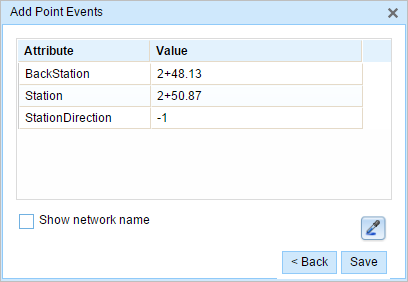 Check the Show network name check box to see which LRS Network the selected event layer is associated with.